When seekers first begin to explore their spiritual calling, and discover that the coincidences and patterns they are noticing may indeed be nudges from the angelic realms, one of the first questions they ask me is what should I be looking for? What do angels really look like, and are the traditional winged figures surrounded by bright light really just figments of the imagination? My response is always the same. Angels present themselves in a way which is acceptable to each individual. There are no rights or wrongs. The imagination is the creative expression of everything in your mind and your heart. Every experience of this lifetime and many others is hidden away in your soul memory. Sometimes certain pictures and thoughts, dreams, or words heard or read, can stimulate the creative aspect within our memory which then invokes pictures in our head. Don’t worry whether it is real or imagined. Some would say nothing in life as we know it is real. When you hear the sound of an angel speak to you, when you feel the wisdom of love touch your heart, when you are stood in the presence of your guardian angel, whether in your dreams or physical dimension, not only will you never forget, your life will never quite be the same. Your spiritual journey lasts through many lifetimes and in this life began the moment you were conceived and will continue until – and beyond – the moment you pass over. 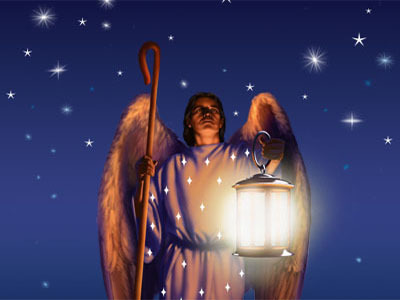 But for many, discovering angels through books, meditations or workshops often feels like the beginning of the journey. Spiritual educators have many approaches to their teaching and the path to enlightenment may begin with an awakening at any number of cross-roads or life experiences. However, for me as a teacher who works closely with the angelic beings it is the Archangel Gabriel, the great enunciator, the communicator who heralds the end of the old and the start of the new. Using the metaphor of ‘feet and legs’ as we set off on this road it is very appropriate to get in touch with your root Chakra. If you’re not familiar with the Chakras do take a look online. The base energy centre of the chakra system relates to all the perceptions and beliefs we have acquired during the first seven years of life. On this first step we reflect and consider those beliefs and decide which, if any, no longer belong to us, and which we can erase. This allows us to move forward with an open mind. 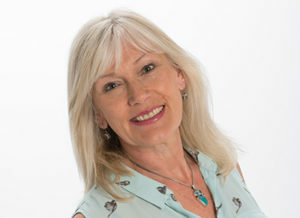 I’d love to work with you personally in greater depth and if you choose to enrol on one of my courses, workshops or retreats you will be welcomed with an open heart. 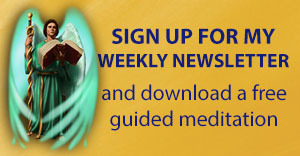 You can find all the details (and of course a free meditation to download) on the website (www.AngelLight.co.uk). But if not, I hope you’ll continue to follow along with my weekly blog, Facebook posts and occasional guided visualisations – joining with me to share this beautiful spiritual journey together. Really enjoying your new book, I decided to wait till January to start it, so instead of new year resolutions, I’m having a “new beginning”…… Looking forward to being with you again in Glasgow in July. Oh thats lovely Flora. Thank you. Yes I look forward to that… Blessings to you too.